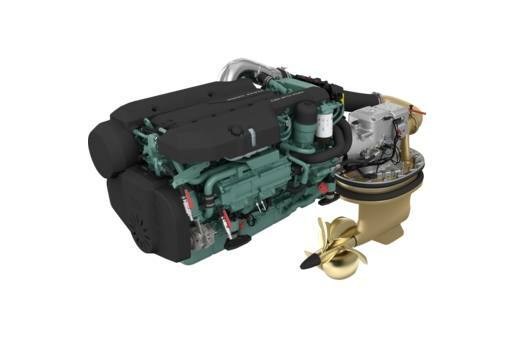 Volvo Penta D8-IPS700 is a perfectly matched package, powered by the in-line 6-cylinder D8, a 7.7-liter, common-rail diesel with a twin-entry turbo, and supercharger for incredible, low rpm response. Working together with a perfectly matched IPS15 pod, twin counter-rotating propellers and the Electronic Vessel Control system, this package offers excellent maneuverability, long action range and low emissions. Maneuverability: Steerable pods provide superior slow-speed maneuverability and excellent high-speed handling. Docking is easy and safe, even in confined spaces. The outstanding maneuverability also leads to efficient driver response and high safety. High performance: This perfectly matched, integrated engine and pod system with a turbo provides outstanding performance and excellent maneuverability throughout the operating range. By working in undisturbed water, the forward-facing propellers enhance the already high performance. Comfort: The engine and pod system is designed for low noise and pleasant onboard environment. A combined rubber suspension and seal absorb propulsion forces and vibrations. And all exhaust fumes are emitted through the pods and into the prop wash for improved comfort. Electronic Vessel Control: Volvo Penta Electronic Vessel Control fully integrates the engines, electronics and the unique set of optional features, such as Joystick Docking, Dynamic Positioning System, Glass Cockpit and more. e-Key is standard. The system also includes built-in redundancy to ensure there is always a backup system at hand. Solid and robust package: The engine is designed and built to be immensely strong, with a cylinder block made of compacted graphite iron and a cast-iron cylinder head. Together, the engine and pod forms a compact, robust and highly efficient package that is easy to install. This gives excellent reliability and long-term durability. Long service life: A propulsion system from Volvo Penta is easy to maintain. Our comprehensive range of high-quality oil, lubrication and coolant ensures uptime and top performance in the long term. Accessories include a fuel pre-filter to keep the engine in good condition.